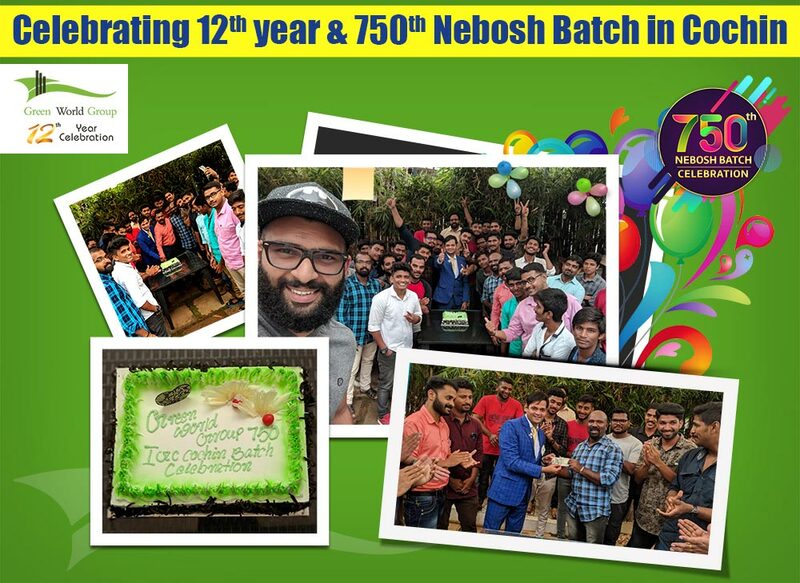 As part of our 12th Year & 750th NEBOSH IGC Batch, we have Celebrated with our Prestigious Candidates in Cochin. Mr. Jayandran Mohan (Batch Tutor) has introduced 12th YEAR & 750th NEBOSH IGC BATCH Logos to the Candidate and it is been appreciated by all Candidates. Mr. Joseph Babu (Batch Supporting Staff) has given speech about Green World Group and way how we travelled towards 12th Year. He urged all the Candidates to achieve good results in NEBOSH Examination and wished future Endeavour for the Candidates. During Celebration, Mr. Jayandran Mohan did Cake Cutting along with Candidates to mark 12th Year & 750th NEBOSH IGC Batch Celebration. Mr. Jayandran Mohan has asked one HSE Profession related question to the Candidates and among all, one Candidate Mr. Justin Varghese has give the Best Answer and on spot he is been felicitated with Cash Award presented by Mr. Joseph Babu. Last but not least, we have planned to Award the “Best Performer” among Candidates on 11th Day (Final Day Training Session) by considering all the Class Mock Tests. Candidate will be awarded with Surprise Gift. We are wishing all the very best for each and every Candidates for their further studies & Future Endeavour.